The Cubs have called up a viral video sensation. No, don't worry - it won't be Lil Bub, Grumpy Cat, Rebecca Black, or the Double Rainbow guy suiting up for the North Side ballclub (although.... that might be kind of fun). While the latest player to don blue pinstripes did earn his first bit of mainstream press due to his antics on camera, he is still a legitimate baseball player. However, that man, Taylor Davis, is not one you would want to take on in a staring contest. That YouTube clip of the creepin' Cubs catcher, has gotten a fair amount of play on the interwebs over the past few weeks, earning more than 500,000 views, several follow-up interviews, and attention from such outlets as Sports Illustrated, ESPN's Sports Center, and Deadspin. Not since Kris Bryant suited up with the Iowa Cubs has the Triple A club seen so much national attention and it's all because of an ongoing staring contest with the camera. In case you were wondering, the gag is based, in part, on the comedy stylings of Ben Stiller and his preening, male model character, Derek Zoolander. So, I suppose we can call Taylor's look Cubbie Blue Steel. That said, it's important to note that the backstop is more than just a gag - through 99 games in Des Moines, he batted .292 with 59 RBI and 25 doubles. Furthermore, his clubhouse presence has been recognized numerous times by players who have passed through Iowa on their way to the Show. 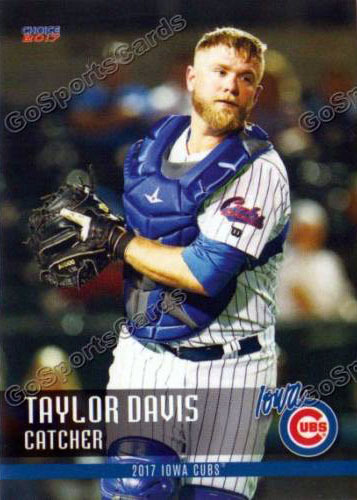 As Rob Zastrynzy, tweeted out a few days back, "every team needs a Taylor Davis." Thus, with the conclusion of the regular season portion of the minor league baseball, Mr. Davis was rewarded for his hard work and presence with his first call-up to the Major Leagues, as was announced yesterday afternoon. It's always nice to see a guy make his MLB debut, especially when it's someone who might otherwise be labeled as an "organizational guy." 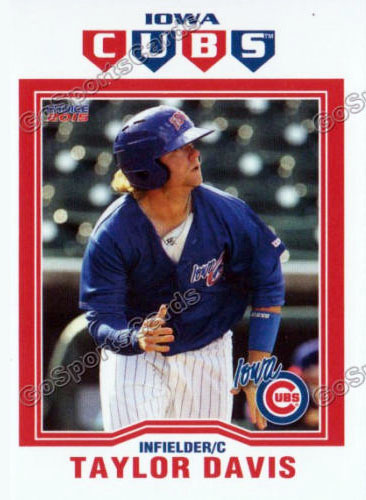 You see, Davis was drafted in 2008 (by the Marlins) and has been kicking around the Cubs system since 2011, filling in wherever his services were needed, a la Crash Davis. These are the unsung heroes of professional baseball and it's a pleasure to see one of them awarded for their services. Now, he gets to experience the thrill of a bonafide pennant race. Unfortunately, since he never was considered a top prospect or even that notable of a minor league player, "the King of Stares" does not have much of a cardboard presence, which makes adding him to my Cubs All-Time Roster Collection binder quite difficult. He has never appeared in a "mainstream" minors set like Bowman, Pro Debut, or Heritage, leaving me with no other options beside team-issued, stadium sets. This is not an ideal situation, since they aren't exactly common and prices for these souvenir singles are often over-inflated on the second hand market. 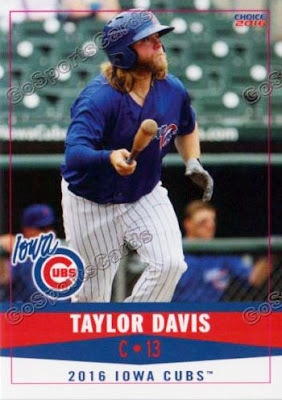 So, if anyone happens to have a broken up team set and they don't care if the Taylor Davis goes missing.... Otherwise, I'm sure I'll eventually cave and plop down the dinero. It's not as if he'll be showing up in the Update set, as the September call-up is definitely far too late. Also, while his story is a fun one, I'd say that the odds are stacked against him sticking around long enough for any sort of mainstream card. With Alex Avila, Rene Rivera, and Victor Caratini all ahead of him on the depth chart at catcher, a quickly-recovering Willson Contreras nearing a return, and Kyle Schwarber available to don the tools of ignorance in a pinch, it's kind of a surprise that the backstop got the call, at all. At any rate, welcome to Chicago, Derek Zoo... I mean... Taylor Davis. Here's hoping that the viral video star can use his newfound, fifteen minutes of fame to become a legitimate baseball star and rise above the ranks of the Bed Intruder guy, the "cash me ousside" girl, and Charlie the Unicorn. I guess we'll "see" how this develops. The video is pretty fun! He's always been a decent offensive catcher. I wonder how he stacks up defensively though. Hey, a shtick is a shtick. That guy is awesome. Count me in as part of his fan club.